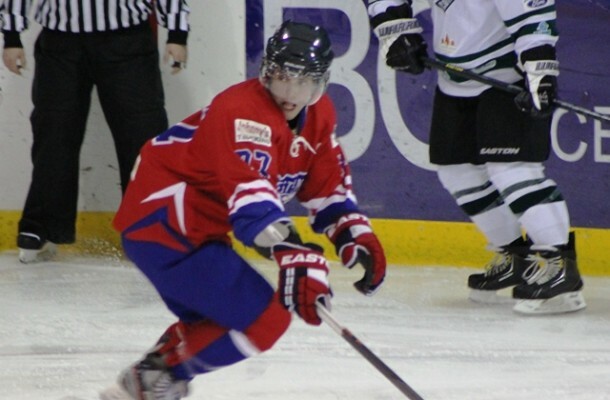 Last week the Corner Brook Royals traded forwards Justin Barbour and Colin Power to the Grand Falls-Windsor Cataracts for forward Brandon Nicholas and defenseman Dane Marshall. The trade left many Royals fans a bit puzzled especially after Barbour was tied for team scoring in the 2013-14 season with 13 goals, 15 assists for 28 points. Power was seen limited action, playing just 10 games with most of his time spent on the third and forth lines for the Royals. In return, the Royals get Nicholas who scored 8 goals, 20 assists with 28 points, matching Barbour’s output. Defenseman Dane Marshall is seen as being a fast and slick on the blueline, adding a much needed boost in speed that was missing from the Royals defense. In making the trade the Royals are sending a clear message they are building a much different roster this year. They are focused on putting speed and skill throughout their lineup and are willing to make big moves to make this happen. While both Barbour and Nicholas put up identical numbers, Barbour has shown that he can put the puck in the net, something that the Royals struggled with over the last few seasons. However, other additions to the Royals lineup shows that they have added scoring punch and probably lacked the play maker required to setup the play coming down the ice. This is the role that Nicholas can easily fill. Additionally, Nicholas adds proven results and leadership to the Royals lineup, something that will be required by the Royals as they drive deep into the season. This move may prove priceless when it comes to making a run for the Herder Championship this season. Barbour on the other hand is going to a team that has proven it can win and depending on how he is used within the Cataracts lineup will determine his future. Given the depth of talent on the Cats team, he may see less ice time than he has in the Royals lineup and that could hurt his numbers. Overall, while this is a pretty even trade for both teams, there is a slight advantage to the Royals. Nicholas and Marshall will fill some key positions in their roster. This has the potential to allow these two players to shine as stars in the Central West Newfoundland Senior Hockey League.